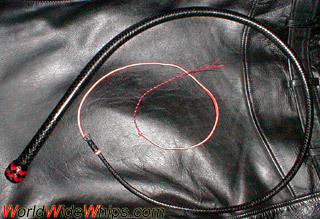 My seventh whip by Mike Murphy, made to my specifications, based on the American pattern bullwhip. Without the wrist loop and the handle knot, it is a very elegant whip, smooth-acting plus appearing far longer than it actually is. The thong is 12plt (downto 8), 4ft long with a dyed whitehide fall.